Despite its name, this resident bird's diet is not limited to bees. I've seen it hawk many types of insects in the air, including dragonflies like this one in the photo. I suppose the bird-namers chose "bee-eater" for brevity. It's indeed awkward to call this one a Blue-tailed Dragonfly-eater. 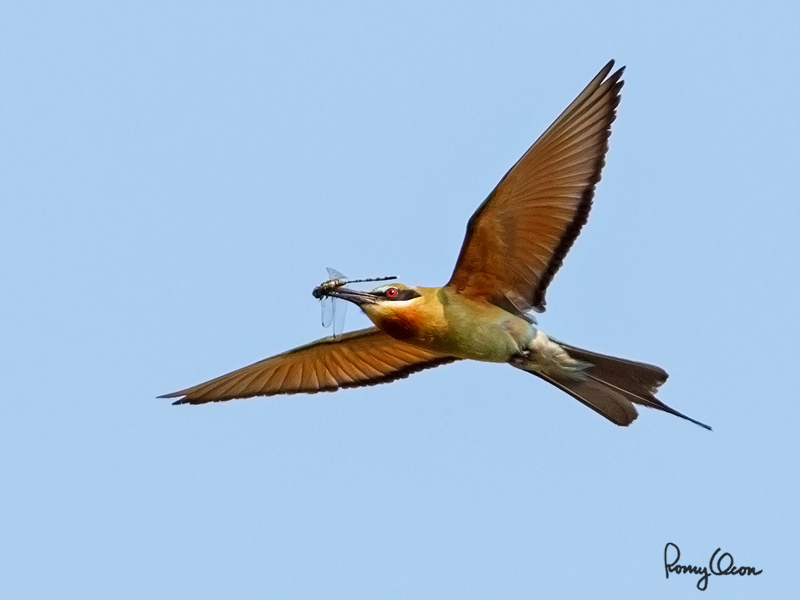 These birds often fly high over the Bued River early in the morning to catch their breakfast. I had to mount a 2x teleconverter on the 400 2.8 L IS to get a bit closer. Even then, I had to crop massively. The AF speed of the combo is still pretty decent, but initial subject acquisition and tracking through an angle of view of 1,280 mm (800 mm x 1.6 crop factor) is very tough for me. I was very lucky to get and keep this one within the frame at all. 475B/516 support, major crop resized to 800 x 600.